Many people don’t realise that colour blindness is a very common condition amongst the general population. Prevalence of colour blindness ranges from 8-10 % of males and 0.4% in females depending on which studies you read. There are also several different types of colour blindness, the commonest of which is a difficulty in distinguishing the colours red and green from other colours. Back in April the BBC website ran a news story called “Are colour blind gamers left out?” which looked at the difficulties faced by colour blind gamers. As a result of this story the Colour Blind Play website was set up to help raise awareness of colour blindness. Unfortunately the site hasn’t been updated since the end of April. A few days ago, Sledgehammer Games revealed that they are working on a colour blind assist option for their upcoming Call of Duty: Modern Warfare 3 game. They also acknowledge the prevalence rates of colour blindness amongst the general population and estimate that up to 1 million Call of Duty gamers are colour blind. I interviewed Charlie Seligman, a colour blind gamer, about the impact this condition has on his gaming habits. 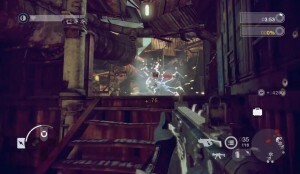 What do you think of the recent announcement that COD: MW3 will have a colour blindness mode? CS: It’s great that companies are starting to realise how common colour blindness is and starting to do things about it. How long have you been playing videogames for? CS: Well, I’m 34 now and I used to play on my dad’s ZX81 when I was about 6. So about 28 years. What type of colour blindness do you have? CS: Red/green as opposed to blue/yellow. I’ve got the more common one. I think blue/yellow is 1 in 200 and red/green is 1 in 14. CS: First found out I had it when playing golf at school. I was playing with a red tee and I hit the ball and went ”I’m always bloody losing my tee.” My mate was like, it’s just there. Where? There! When he pointed at it I could see it. So I thought I better get myself checked out and I went to see an optician. They said that I was as perfectly red/green colour-blind as you can get. When did you notice your colour blindness when playing video games? 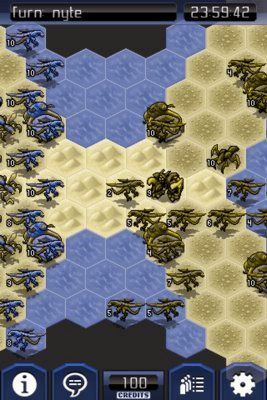 CS: Command and Conquer (1995), the original game when there were red dots. Or maybe even before that with Populous 2 (1991). I think it might have been Populous 2 actually on the Amstrad PC. I’m sure that was reds and blues against green. Command and Conquer was the one that really annoyed me because the enemy always used to be red. Whereas everyone else would see the enemy coming in by seeing a see a red dot on their radar I just wouldn’t notice it. So I was at a distinct disadvantage, because the enemy is always red. Also Halo 2 that was a nightmare too. CS: I just didn’t do as well as other people. Did you look around in the games for options or anything to help? CS: No [laughs]. I just assumed they wouldn’t have any. Has your colour blindness stopped you buying or playing a game? CS: Never stopped me buying a game as I wouldn’t have known until afterwards. I wouldn’t say it’s stopped me playing but the number of FIFA games I’ve had to restart because if you’re player 1 and player 2 you are red and green. Player 2 and player 3 are yellow and blue which are perfect for colour-blind people. But red and green on the same team is a killer. I’ve defiantly had to restart numerous games of FIFA because of this. Do you notice much of a difference between playing on the current consoles? CS: No not really. I would say that when I was doing some DDA (Disability Discrimination Act) work with a bank which is all about making websites colour-blind friendly, so you can’t have red against gray and all that stuff. I remember being appalled by the games industry because they weren’t following these rules at all and didn’t seem to care when it was such a bigger deal for them. If I can’t see some red against gray writing and I have to squint a bit when I’m using my online banking, [no] big deal. But if you’re playing a game and you’ve got a little map that you can’t really see very well and then you can’t see the reds on top? When it’s 1 in 14 people it’s not like it’s rare! Have you ever seen anything that says we appeal to colour blind gamers on the box art, reviews or advertising for games? Do you think about your colour blindness when buying a game? CS: Never. I just buy them. I remember when Halo 2 came out and I was gutted because we all went online and I realised it was going to be a nightmare. Do you think the games industry could do more to help? CS: Far more. It’s so easy, especially for the big guys. Just get a colour-blind person in to do some of the testing along with your hundred of thousand other testers. Just pay a little bit extra maybe a 1 GBP and hour if you have a colour-blind friend. Do a test at the start to check they are colour-blind get them to test and then you’ve covered off DDA stuff. It’s dead easy, dead cheap and dead quick. Have you ever complained to any games companies about the lack of support for colour blindness? CS: No. Hmm, I suppose now they can do patches. What do you do if you can’t play a game because of your colour blindness? CS: I have taken a game back to GAME and complained. Any particular genres that are particularly bad? 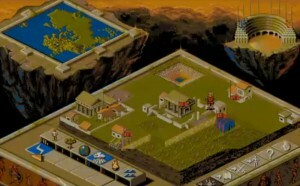 CS: All the ones with a map like Populous, Command and Conquer and Halo. You have a little map at the top right hand corner of the screen. The enemy is always red and the map is always green or brown. CS: If they involve a map, absolutely. Like Halo. Halo was more when you saw the people in the distance. The enemies had a red thing about their head which I couldn’t see. I remember the odd times in games where it’s something like, oh that guy who had the red scarf or the red top or the red bits. They often use red as the sort of highlight colour. And I’ll be like, nope, never saw that. They seem to think because red highlights to non colour-blind people, we’ll use that. Whereas yellow is highlighted to everyone, so why not use yellow? Any other games you’ve had a problem with? CS: Uniwar on the iPhone and Red Dead Redemption’s multiplayer mode. In Red Dead the labels above people’s heads just aren’t clear enough. Uniwar, well, see for yourself. Brink – Absolutely shocking. I cannot see a thing [on the map screen] except when the background is fully dark. Thanks for your time Charlie. 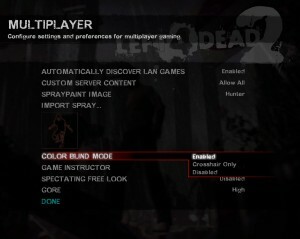 As wells as MW3 there are other games and games companies that do support colour blind gamers. Valve Software for example, have an extensive and well thought out colour blind mode in their Left for Dead games, which is covered in great detail over on the Color Blind Gamer website. Back in April 2010, DICE patched Battlefield: Bad Company 2 game to include support for colour blind players in multiplayer matches. If you are worried that you may have colour blindness or just are curious about the different tests then Daniel Fluck’s Colblindor website has a great selection of them available as well as heaps of other information about colour blindness. Vischeck allows you to see what websites and images looks like to colour blind people. Is your website colour-blind friendly? We ran The Average Gamer homepage and this post through the red/green simulators. Not a bad result at all. One of the popular “Hey, Ash Watcha Playing?” videos from Destructoid has a rather humorous take on colour blindness in gamers. The video includes a bit of swearing, so put your headphones in if you’re at work. Given that colour-blindness among men runs at a up to 10%, it’s sad that gamers need to buy these titles before realising that they can’t play. Should we introduce another PEGI-style symbol on the packaging for colour-blind compatibility? 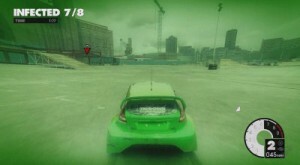 Update 23rd Aug 2011: Nice to see the Colour Blind Play website being updated again.